The Wharf is a $2 billion, world-class, mixed-use waterfront development located on the historic Washington Channel. 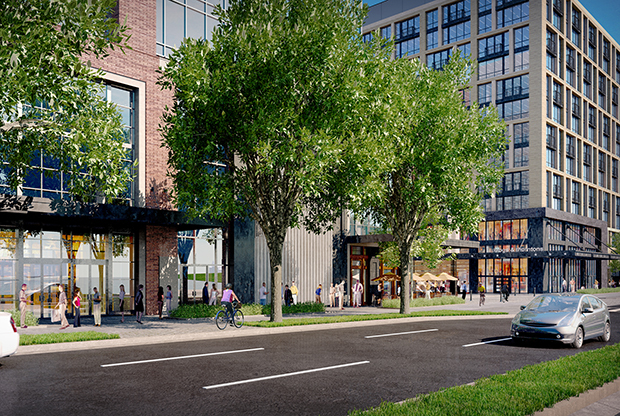 As part of the first phase of construction of the landmark billion-dollar redevelopment of the Southwest Waterfront, the commercial office building fronts Maine Avenue with street level retail. The 227,000 sf, 11-story office building project provides a civic presence that relates to the grand urban tree-lined boulevards found throughout the District, with an architecture that is complementary to the adjacent community while reflecting its use as an office building. Street level retail enlivens the neighborhood while contributing to a pedestrian scaled neighborhood. The Class A building makes sustainability a priority, designed to LEED Gold standards. A visual rhythm and balance is established by a base of three stories and a middle and top section of seven stories of brick with an increasing percentage of windows. The painted aluminum curtain wall expresses the corner of the building as it turns at Maine Avenue to the District Pier. This element visually reinforces the entrance to the District Pier and relates to the building’s vertical elements.